Raymond Hook Specialty | HOOKED ON CHEESE: I’M MELTING!!! HOOKED ON CHEESE: I’M MELTING!!! Melted cheese makes the winter a little bit more bearable. I can’t stand the cold of winter – I’ve always been a warm-weather, sunshine-loving guy. Thankfully, there’s one thing that never fails to help me forget about the bitterness of winter: melted cheese in all its delectable forms.Fondue is the #1 classic wintry melted cheese dish. This mixture of Swiss mountain cheeses like Emmental or Gruyère and white wine (plus the optional kirsch) warms you to the core.Dip cubes of crusty bread in your fondue and be sure to scrape the bowl to get the browned cheese at the bottom – it’s my favorite part. I always drink JJ Prum Riesling with my fondue: it’s an outstanding combo. Just add a few friends and you have yourself a serious winter shindig. I love making Raclette as well: taking Swiss Raclette cheese, melting it on one of a few different types of Raclette machines, then scraping it off as it browns. Traditionally, it’s layered on top of boiled fingerling potatoes and served with grain mustard, onions, cornichons and dark rustic bread. I like pairing raclette with a medium-bodied red wine or Belgian white ale to cut through the buttery quality of the cheese. 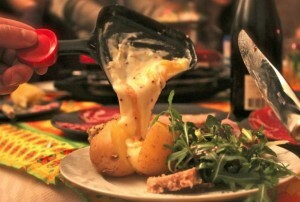 Note: if you don’t own a Raclette machine, never fear: they can usually be rented from a full-service cheese shop. However, the ultimate melted cheese for winter is the highly sought-after, luscious Vacherin, available in limited quantities and only during the winter months. My friend, Swiss cheese importer Caroline Hostettler, always has an outstanding version. Served slightly warmed, this one-of-a-kind cheese has a liquid interior that’s so creamy, flavorful and smooth that it takes every ounce of my self-control to not eat the entire cheese by myself. When I purchase one of these beauties, I save it for a special occasion and pair it with a warm baguette and the finest champagne I can get my hands on. These three winter cheeses are a great place to start, but there are many more meltable cheeses out there for you to discover this season. Don’t be afraid to brave the cold and explore your possibilities! Take it from me: the delicious results of your trekking will more than make up for all that time slogging through the snow and sleet. You can follow Raymond’s cheese adventures on Facebook, Twitter and his website.